This boutique Charlottenburg hotel was recently revamped and the individually decorated rooms have a fresh look, with classic Farrow & Ball colors and a mix of modern and vintage furnishings. The building shows its age only in the antique wood elevator and an occasionally creaky floor. You can serve yourself tea or coffee in the breakfast room throughout the day and mix your own drinks at the honor bar. High stucco ceilings and wood floors are the hallmark of the individually designed rooms, which come with free Wi-Fi, cable TV, and tea- and coffee-making facilities. Suites add sitting areas or separate living rooms. Seeking a quiet room? Choose one of the suites, which all face the courtyard. Brightly-colored tiled bathrooms have marble sinks and, depending on the room, either a shower or tub. The refined wood-paneled lobby lounge has sleek, low-slung black leather sofas and a big picture window. A petite, landscaped seasonal roof terrace overlooks the rooftops of West Berlin. There is a breakfast buffet (12 euro) that includes freshly made eggs, homemade jam and cakes, and selected meats and cheeses. There is no full on-site restaurant. You can mix your own drinks at the honor bar in the breakfast room. 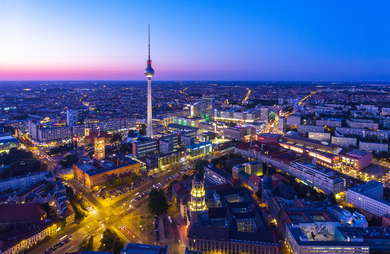 Less than a block from upscale shopping on Kurfürstendamm, the hotel is an 8-minute walk from the Charlottenburg S-Bahn station. Locals flock to the rustic tables and chairs of Jules Verne (7-minute walk) to enjoy the wallet-friendly French menu. The convivial atmosphere of the Paris Bar (15-minute walk), a traditional brasserie, has been attracting artists, actors and musicians (it was a regular hangout of David Bowie and Iggy Pop) since 1979. Dress smartly to gain admittance to the miniscule, 25-seat Rum Trader (19-minute walk), which boasts an excellent selection of rum- and gin-based drinks served in vintage tumblers. The diminutive Bar Zentral (18-minute walk), tucked inside the arch of the S-Bahn, has a cool, curved tile ceiling and excellent, affordable cocktails. The hotel’s setting, inside a historic art nouveau building, its stylish, individually designed rooms plus the friendly, personal service gives it a home-away-from-home feel. And its central location, near Kurfürstendamm’s shopping and the C/O Berlin photo gallery, is ideal.